Larry Abel Jon Tracy's Pirates of Penzance: where Hot Topic meets Gilbert and Sullivan. There's always been an impulse in children's programming to mollify an implied adult audience, hopefully without sacrificing youthful appeal. That's perhaps more important in a medium like theater, in which adults are the actual paying consumers — it's a lot more effort to take your kids to a venue than it is to plop them in front of a television, and that's to say nothing of the ticket price. Local director Jon Tracy seems to know that all too well, since many of his productions at the children's theater company Berkeley Playhouse have a grownup sensibility, even if they're based on children's stories. His Wizard of Oz included more than a few nods to Pink Floyd and a hidden picture in the geometric set design (by Tracy's wife Nina Ball). This year's Pirates of Penzance is similarly clever, with its industrial punk-rock aesthetic and revised score, which only flirts with the source material by Gilbert and Sullivan. Although the audience at last Sunday's evening performance was evenly distributed between kids and parents, it was the latter group that seemed to enjoy it most. That was apparent from the opening scene, when the curtain rolled back to reveal a large vessel with a spangled steering wheel and an ensemble of sailors dressed in Hot Topic paraphernalia (complete with hook hands and one or two blacked-out teeth). While this Penzance draws liberally from the Savoy opera and the 1983 film by Joseph Papp, the set — conceived by Ball — more closely resembles City of the Lost Children. Evidently, Tracy realized there a couple different ways to frame the story. You could see these pirates as aimless mariners living in an artificially testosterone-heavy environment, or you could see them as kids who've managed to come of age far outside the real world, and somehow not become total savages in the process. Depending on how you frame it, Penzance is a cauldron of lust, or an idyllic parallel universe. Tracy's version of "idyllic" is a lot more cold and dingy than the word implies, but he retains all the romantic notions. In the first scene of Penzance, protagonist Frederic (John Paul "JP" Gonzalez), an indentured sailor just one hour away from his 21st birthday, is reading poetry to a cast of shipmates he's about to abandon. (Such are the terms of his contract — fifteen years of service before he's cut loose and sent to shore in an inner-tube.) 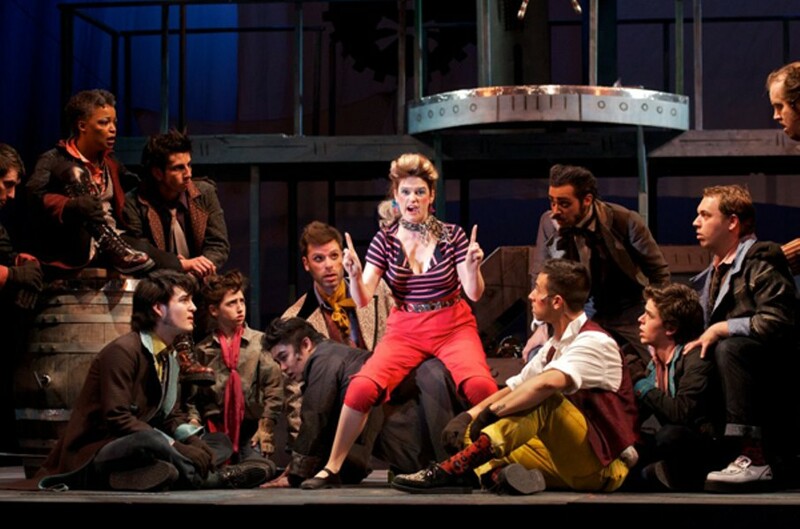 The pirates, who are notoriously kindhearted and famously inept, listen raptly and then burst into song. Music Director Jonathan Fadner filched his score from the original play and readapted it for a rock band, which means a lot of songs hover on one or two riffs. A person familiar with Penzance would still recognize most numbers, which are about carousal on the open sea — the opener is "Pour, Oh Pour, the Pirate Sherry." That's not exactly a value that most Berkeley parents would want to inculcate in their children, although, granted, there aren't any visible open containers in this production. The ensemble members, decked out in wallet chains and zombie makeup (the work of costume designer Abra Berman), should look familiar to any kid who grew up in the vicinity of Berkeley High School. The pirate king, played by Cathleen Riddley, is a stern but likeable patriarch (or matriarch). Ruth, the piratical maid (Rana Weber), is a tart Jersey girl who chomps gum like a cow chewing cud. What's most impressive about Tracy's Penzance is the extent to which he remained loyal to the script, while making it palatable for a modern audience. Maybe that's not too hard, since Gilbert and Sullivan were so good at weaving humorous yarns. A band of lily-livered pirates is, after all, a perfect template for a children's story about tolerance and the importance of compromise. Tracy said he didn't actually alter the script that much. He did allow the cast to explain lines like, "You've never molested an orphan" ("A dated reference," they tell the audience, in unison), and he breaks the fourth wall a few times, to make room for a cute punch line. Tracy and Fadner also whittled the score down quite a bit, partly to drive the plot forward, and partly to honor the punk rock trope of never having songs that run over three minutes. It's certainly not a "park and bark" opera, as the cliché goes, but there are definitely moments of sublime musical theater — like the finale of Act One, which pairs the Major-General's four opera-trained daughters with a gloriously harmonious ensemble. Style and simplicity might explain why Tracy's concept fit so well, and why the world he's created would appeal to any audience member. The barbs in this Penzance are smart without being cerebral; a couple adults cackled through the entire Sunday evening performance, but Tracy says that at others, the kids are the ones who "get it." Hopefully none of them run home and ask their parents for sherry.